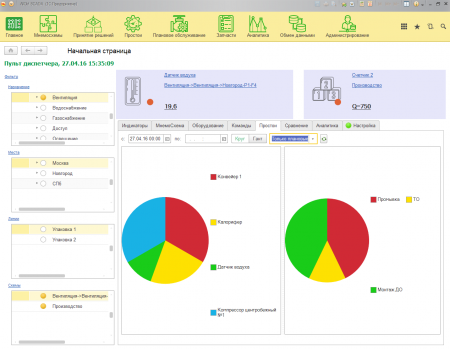 The integrated data analysis system allows receiving real-time information about the performance of both the enterprise or its unit and the specific equipment. 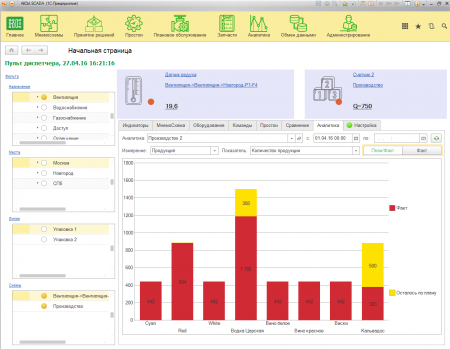 Both plan-actual and plan-factor types of analysis are available to the user. The histograms can be used to see how much specific products are produced. Analytical indicators can be used to determine how much of the product has been produced and how much is left up to the implementation of the plan. 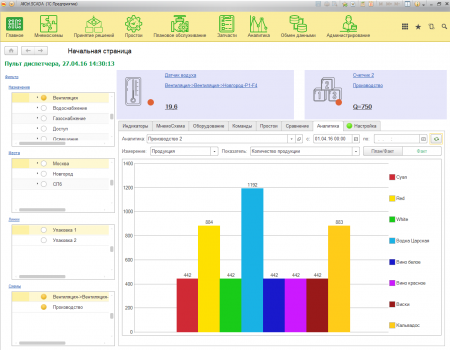 It is easy to collect data from various types of production facilities. Information from a variety of data sources (programmable logical controller, I/O modules, network equipment, and HMI (Human-machine Interface) applications) is stored to generate real-time reporting and analysis. Up to 80% of the production budget is usually spent on building and further support of data storage systems in working condition. Sharing of archival data is an integral part of the work in the developed automated control systems. Therefore, the need to create "cloud" resources for computing, data transfer and storage is becoming apparent. Data analysis systems allow you to rent infrastructure and its components, paying for only those resources that are actually used in production.